4 Spot-Orb Weaver spiders mature in late summer and autumn. The best distinguishing feature is the pattern of four large spots on the abdomen, in combination with the overall shape and eye pattern characteristic of orb web spiders. Please note that the spider is very variable in colour and the pattern becomes changed as the abdomen becomes distended with eggs. 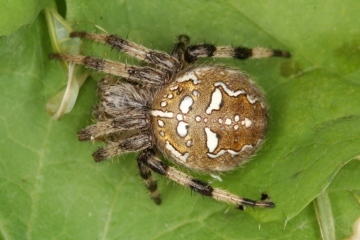 The pattern is also similar to, and sometimes indistinguishable from, the much rarer Marbled Orbweaver Araneus marmoreus var. marmoreus. The spider is not normally found in gardens. It is found on vegetation which has sufficient height and strength to support the large orb web, such as undisturbed grassland, heather and gorse. The web is usually found stretched across the gap between plants, with a large tent-like retreat at one side, where the spider can be found if not in the centre of the web. This very variably-coloured spider holds the British weight record.